Blues Point (formerly known as High 5) are Lorraine Silk, Leyla Nassif, George Washingmachine, Rob Maxwell Jones (some of Australia's finest singers), and Craig Scott (one of Australia's finest bass players). The repertoire ranges from jazz standards by Fats Waller, Irving Berlin and Gershwin through to hits of Ray Charles, Stevie Wonder, Joe Cocker, Elvis Presley and Queen plus some very funky gospel tunes, with arrangements by George Brobeck, Julian Lee, Judy Bailey and Roger Frampton. The group has appeared at the Manly International Jazz Festival, Coogee Jazz Festival, Bellingen Jazz Festival, Darling Harbour Jazz Festival, Newcastle Jazz Festival, Jazz in the Domain Sydney Festival, Kiama Jazz Festival, Wollongong Jazz Festival, Sydney Acappella Festival, Tilbury Cabaret Hotel, Darling Harbour Events, Rocks Markets events, The Basement and many corporate functions. Blues Point's intricate vocal arrangements are presented with a unique Australian flavour. 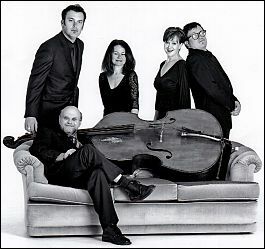 The group excels in a concert setting, a cabaret presentation, or is great at a cocktail party. A superbly entertaining group, with the added bonus of one of Australia's most sought after MC's, George Wahingmachine.